For decades, milk was an essential beverage, the perfect sidekick to all the foods we loved. But as tastes and food culture changed, milk lost its place at the table. At the same time, the content around food exploded, and milk was left out of the picture. Milk had become irrelevant. Through research, the California Milk Processors Board found that, although people were buying less milk, they actually did enjoy drinking it with their favorite foods, i.e., the desire for milk was greater than the actual consumption. To make milk relevant again, it needed to elevate its role within food culture. The board put milk back in the food-culture picture in a literal sense by planting visual cues that food and milk were the perfect pairing. It infiltrated food culture on a number of fronts. 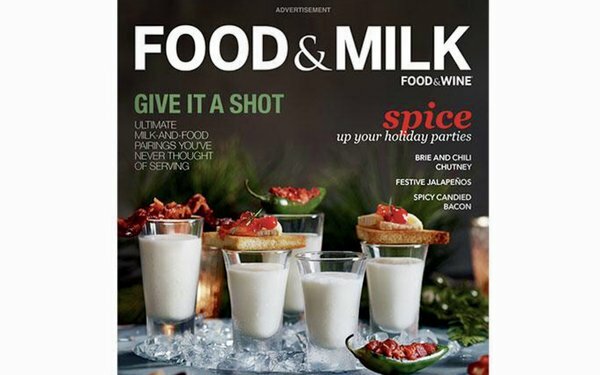 It changed the title of the 40-year-old food institution, Food & Wine magazine to Food & Milk (above). In popular TV shows like “Will & Grace,” “This Is Us” and “Black-ish,” it wove milk into the story lines, with characters like Debra Messing’s Grace dunking Oreos into a fancy glass of milk. On recipe sites like Allrecipes.com, it created dynamic banners that incorporated a food item and suggested how it paired with milk. In over 30 restaurants across California, it created specialty menu items that were designed to be paired with milk. Reported intent for same-day purchase saw a directionally significant lift of 3 points, signaling a closing of the gap between people's stated interest in milk and their actual purchase behavior. Put your product front and center in popular media like TV and magazines. Show how your product fits in with the culture around it. Create things or events with which you product goes well. This was a finalist in the Media Plan category in MediaPost’s 2018 Creative Media Awards.